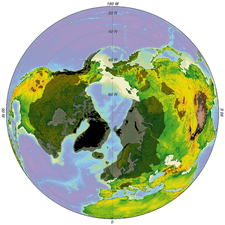 An artist's impression of ice age Earth at glacial maximum. Based on: Crowley, T. J. (1995). "Ice age terrestrial carbon changes revisited". Global Biogeochemical Cycles. 9 (3): 377–389. Bibcode:1995GBioC...9..377C. doi:10.1029/95GB01107. An ice age is a period of long-term reduction in the temperature of Earth's surface and atmosphere, resulting in the presence or expansion of continental and polar ice sheets and alpine glaciers. 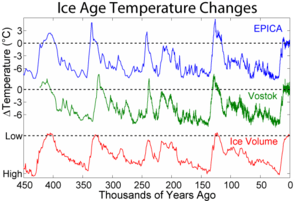 Within a long-term ice age, individual pulses of cold climate are termed "glacial periods" (or alternatively "glacials" or "glaciations" or colloquially as "ice age"), and intermittent warm periods are called "interglacials". Glaciologically, ice age implies the presence of extensive ice sheets in both northern and southern hemispheres. By this definition, we are in an interglacial period—the Holocene—of the ice age that began 2.6 million years ago at the start of the Pleistocene epoch, because the Greenland, Arctic, and Antarctic ice sheets still exist. In 1829, independently of these debates, the Swiss civil engineer Ignaz Venetz (1788–1859) explained the dispersal of erratic boulders in the Alps, the nearby Jura Mountains, and the North German Plain as being due to huge glaciers. When he read his paper before the Schweizerische Naturforschende Gesellschaft, most scientists remained sceptical. Finally, Venetz convinced his friend Jean de Charpentier. De Charpentier transformed Venetz's idea into a theory with a glaciation limited to the Alps. His thoughts resembled Wahlenberg's theory. In fact, both men shared the same volcanistic, or in de Charpentier's case rather plutonistic assumptions, about the earth's history. In 1834, de Charpentier presented his paper before the Schweizerische Naturforschende Gesellschaft. In the meantime, the German botanist Karl Friedrich Schimper (1803–1867) was studying mosses which were growing on erratic boulders in the alpine upland of Bavaria. He began to wonder where such masses of stone had come from. During the summer of 1835 he made some excursions to the Bavarian Alps. Schimper came to the conclusion that ice must have been the means of transport for the boulders in the alpine upland. In the winter of 1835 to 1836 he held some lectures in Munich. Schimper then assumed that there must have been global times of obliteration ("Verödungszeiten") with a cold climate and frozen water. Schimper spent the summer months of 1836 at Devens, near Bex, in the Swiss Alps with his former university friend Louis Agassiz (1801–1873) and Jean de Charpentier. Schimper, de Charpentier and possibly Venetz convinced Agassiz that there had been a time of glaciation. During Winter 1836/7 Agassiz and Schimper developed the theory of a sequence of glaciations. They mainly drew upon the preceding works of Venetz, de Charpentier and on their own fieldwork. Agassiz appears to have been already familiar with Bernhardi's paper at that time. At the beginning of 1837, Schimper coined the term "ice age" ("Eiszeit") for the period of the glaciers. In July 1837 Agassiz presented their synthesis before the annual meeting of the Schweizerische Naturforschende Gesellschaft at Neuchâtel. The audience was very critical and some opposed to the new theory because it contradicted the established opinions on climatic history. Most contemporary scientists thought that the earth had been gradually cooling down since its birth as a molten globe. The chemical evidence mainly consists of variations in the ratios of isotopes in fossils present in sediments and sedimentary rocks and ocean sediment cores. For the most recent glacial periods ice cores provide climate proxies from their ice, and atmospheric samples from included bubbles of air. Because water containing heavier isotopes has a higher heat of evaporation, its proportion decreases with colder conditions. This allows a temperature record to be constructed. However, this evidence can be confounded by other factors recorded by isotope ratios. There have been at least five major ice ages in the earth's past (the Huronian, Cryogenian, Andean-Saharan, Karoo Ice Age and the Quaternary glaciation). Outside these ages, the Earth seems to have been ice-free even in high latitudes. Rocks from the earliest well established ice age, called the Huronian, formed around 2.4 to 2.1 Ga (billion years) ago during the early Proterozoic Eon. Several hundreds of km of the Huronian Supergroup are exposed 10–100 km north of the north shore of Lake Huron extending from near Sault Ste. Marie to Sudbury, northeast of Lake Huron, with giant layers of now-lithified till beds, dropstones, varves, outwash, and scoured basement rocks. Correlative Huronian deposits have been found near Marquette, Michigan, and correlation has been made with Paleoproterozoic glacial deposits from Western Australia. 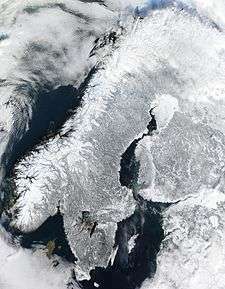 The next well-documented ice age, and probably the most severe of the last billion years, occurred from 850 to 630 million years ago (the Cryogenian period) and may have produced a Snowball Earth in which glacial ice sheets reached the equator, possibly being ended by the accumulation of greenhouse gases such as CO2 produced by volcanoes. "The presence of ice on the continents and pack ice on the oceans would inhibit both silicate weathering and photosynthesis, which are the two major sinks for CO2 at present." It has been suggested that the end of this ice age was responsible for the subsequent Ediacaran and Cambrian explosion, though this model is recent and controversial. 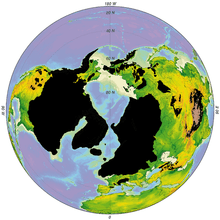 The evolution of land plants at the onset of the Devonian period caused a long term increase in planetary oxygen levels and reduction of CO2 levels, which resulted in the Karoo Ice Age. It is named after the glacial tills found in the Karoo region of South Africa, where evidence for this ice age was first clearly identified. 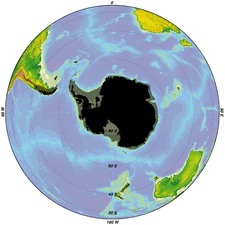 There were extensive polar ice caps at intervals from 360 to 260 million years ago in South Africa during the Carboniferous and early Permian Periods. Correlatives are known from Argentina, also in the center of the ancient supercontinent Gondwanaland. The current ice age, the Pliocene-Quaternary glaciation, started about 2.58 million years ago during the late Pliocene, when the spread of ice sheets in the Northern Hemisphere began. Since then, the world has seen cycles of glaciation with ice sheets advancing and retreating on 40,000- and 100,000-year time scales called glacial periods, glacials or glacial advances, and interglacial periods, interglacials or glacial retreats. The earth is currently in an interglacial, and the last glacial period ended about 10,000 years ago. All that remains of the continental ice sheets are the Greenland and Antarctic ice sheets and smaller glaciers such as on Baffin Island. Evidence of a recent, extreme ice age on Mars was published by the journal Science in 2016. 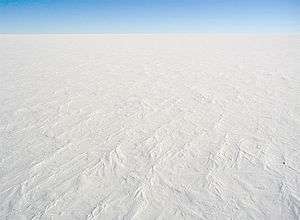 Just 370,000 years ago, the planet would have appeared more white than red. The earth has been in an interglacial period known as the Holocene for more than 11,000 years. It was conventional wisdom that the typical interglacial period lasts about 12,000 years, but this has been called into question recently. For example, an article in Nature argues that the current interglacial might be most analogous to a previous interglacial that lasted 28,000 years. Predicted changes in orbital forcing suggest that the next glacial period would begin at least 50,000 years from now, even in absence of human-made global warming (see Milankovitch cycles). Moreover, anthropogenic forcing from increased greenhouse gases might outweigh orbital forcing for as long as intensive use of fossil fuels continues. According to research published in Nature Geoscience, human emissions of carbon dioxide will defer the next ice age. Researchers used data on Earth's orbit to find the historical warm interglacial period that looks most like the current one and from this have predicted that the next ice age would usually begin within 1,500 years. They go on to say that emissions have been so high that it will not. The causes of ice ages are not fully understood for either the large-scale ice age periods or the smaller ebb and flow of glacial–interglacial periods within an ice age. The consensus is that several factors are important: atmospheric composition, such as the concentrations of carbon dioxide and methane (the specific levels of the previously mentioned gases are now able to be seen with the new ice core samples from EPICA Dome C in Antarctica over the past 800,000 years) changes in the earth's orbit around the Sun known as Milankovitch cycles, the motion of tectonic plates resulting in changes in the relative location and amount of continental and oceanic crust on the earth's surface, which affect wind and ocean currents, variations in solar output, the orbital dynamics of the Earth–Moon system, the impact of relatively large meteorites and volcanism including eruptions of supervolcanoes. 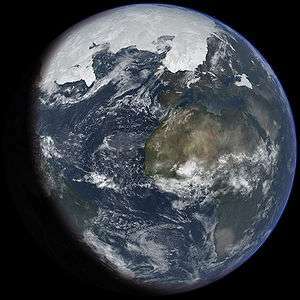 The Snowball Earth hypothesis maintains that the severe freezing in the late Proterozoic was ended by an increase in CO2 levels in the atmosphere, mainly from volcanoes, and some supporters of Snowball Earth argue that it was caused in the first place by a reduction in atmospheric CO2. The hypothesis also warns of future Snowball Earths. Analyses suggest that ocean current fluctuations can adequately account for recent glacial oscillations. 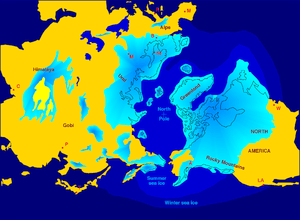 During the last glacial period the sea-level has fluctuated 20–30 m as water was sequestered, primarily in the Northern Hemisphere ice sheets. When ice collected and the sea level dropped sufficiently, flow through the Bering Strait (the narrow strait between Siberia and Alaska is ~50 m deep today) was reduced, resulting in increased flow from the North Atlantic. This realigned the thermohaline circulation in the Atlantic, increasing heat transport into the Arctic, which melted the polar ice accumulation and reduced other continental ice sheets. The release of water raised sea levels again, restoring the ingress of colder water from the Pacific with an accompanying shift to northern hemisphere ice accumulation. There is strong evidence that the Milankovitch cycles affect the occurrence of glacial and interglacial periods within an ice age. The present ice age is the most studied and best understood, particularly the last 400,000 years, since this is the period covered by ice cores that record atmospheric composition and proxies for temperature and ice volume. Within this period, the match of glacial/interglacial frequencies to the Milanković orbital forcing periods is so close that orbital forcing is generally accepted. The combined effects of the changing distance to the Sun, the precession of the Earth's axis, and the changing tilt of the Earth's axis redistribute the sunlight received by the Earth. Of particular importance are changes in the tilt of the Earth's axis, which affect the intensity of seasons. For example, the amount of solar influx in July at 65 degrees north latitude varies by as much as 22% (from 450 W/m² to 550 W/m²). It is widely believed that ice sheets advance when summers become too cool to melt all of the accumulated snowfall from the previous winter. Some believe that the strength of the orbital forcing is too small to trigger glaciations, but feedback mechanisms like CO2 may explain this mismatch. While Milankovitch forcing predicts that cyclic changes in the Earth's orbital elements can be expressed in the glaciation record, additional explanations are necessary to explain which cycles are observed to be most important in the timing of glacial–interglacial periods. In particular, during the last 800,000 years, the dominant period of glacial–interglacial oscillation has been 100,000 years, which corresponds to changes in Earth's orbital eccentricity and orbital inclination. Yet this is by far the weakest of the three frequencies predicted by Milankovitch. During the period 3.0–0.8 million years ago, the dominant pattern of glaciation corresponded to the 41,000-year period of changes in Earth's obliquity (tilt of the axis). The reasons for dominance of one frequency versus another are poorly understood and an active area of current research, but the answer probably relates to some form of resonance in the Earth's climate system. The major glacial stages of the current ice age in North America are the Illinoian, Sangamonian and Wisconsin stages. The use of the Nebraskan, Afton, Kansan, and Yarmouthian (Yarmouth) stages to subdivide the ice age in North America have been discontinued by Quaternary geologists and geomorphologists. These stages have all been merged into the Pre-Illinoian Stage in the 1980s. The weight of the redistributed surface mass loaded the lithosphere, caused it to flex and also induced stress within the Earth. The presence of the glaciers generally suppressed the movement of faults below. However, during deglaciation, the faults experience accelerated slip triggering earthquakes. 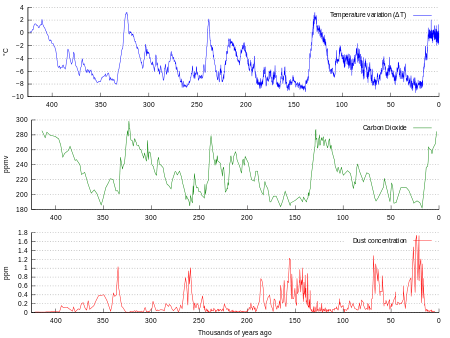 Earthquakes triggered near the ice margin may in turn accelerate ice calving and may account for the Heinrich events. As more ice is removed near the ice margin, more intraplate earthquakes are induced and this positive feedback may explain the fast collapse of ice sheets. ↑ Imbrie, J.; Imbrie, K.P (1979). Ice ages: solving the mystery. Short Hills NJ: Enslow Publishers. ISBN 978-0-89490-015-0. ↑ Gribbin, J.R. (1982). Future Weather: Carbon Dioxide, Climate and the Greenhouse Effect. Penguin. ISBN 0-14-022459-9. ↑ Krüger, Tobias (2013). Discovering the Ice Ages. International Reception and Consequences for a Historical Understanding of Climate (German edition: Basel 2008). Leiden. p. 47. ISBN 978-90-04-24169-5. ↑ Andersen, Bjørn G. (1992). "Jens Esmark—a pioneer in glacial geology". 21. Boreas: 97–102. doi:10.1111/j.1502-3885.1992.tb00016.x. ↑ Davies, Gordon L. (1969). The Earth in Decay. A History of British Geomorphology 1578–1878. London. pp. 267f. ↑ Agassiz, Louis; Bettannier, Joseph (1840). Études sur les glaciers. Ouvrage accompagné d'un atlas de 32 planches, Neuchâtel. H. Nicolet. ↑ Krüger 2008, pp. 223–4. De Charpentier, Jean: Essais sur les glaciers et sur le terrain erratique du bassin du Rhône, Lausanne 1841. ↑ "How are past temperatures determined from an ice core?". Scientific American. 2004-09-20. ↑ Putnam, Aaron E.; Denton, George H.; Schaefer, Joerg M.; Barrell, David J. A.; Andersen, Bjørn G.; Finkel, Robert C.; Schwartz, Roseanne; Doughty, Alice M.; Kaplan, Michael R.; Schlüchter, Christian (2010). "Glacier advance in southern middle-latitudes during the Antarctic Cold Reversal". Nature Geoscience. Macmillan. 3 (10): 700–704. doi:10.1038/ngeo962. Retrieved 2013-10-15. ↑ Lockwood, J.G. ; van Zinderen-Bakker, E. M. (November 1979). "The Antarctic Ice-Sheet: Regulator of Global Climates? : Review". The Geographical Journal. 145 (3): 469–471. doi:10.2307/633219. JSTOR 633219. ↑ Hyde WT, Crowley TJ, Baum SK, Peltier WR (May 2000). "Neoproterozoic 'snowball Earth' simulations with a coupled climate/ice-sheet model" (PDF). Nature. 405 (6785): 425–9. doi:10.1038/35013005. PMID 10839531. ↑ "Mars Used To Look More White Than Red". Popular Mechanics. 26 May 2016. Retrieved 28 May 2016. ↑ Berger A, Loutre MF (August 2002). "Climate. An exceptionally long interglacial ahead?". Science. 297 (5585): 1287–8. doi:10.1126/science.1076120. PMID 12193773. ↑ "Next Ice Age Delayed By Rising Carbon Dioxide Levels". ScienceDaily. 2007. Retrieved 2008-02-28. ↑ Bennett, Matthew M.; Glasser, Neil F. (2010-03-29). Glacial Geology: Ice Sheets and Landforms. Wiley. ISBN 9780470516904. ↑ Black, Richard (9 January 2012). "Carbon emissions 'will defer Ice Age'". BBC News. Retrieved 10 August 2012. ↑ Luthi, Dieter; et al. (2008-03-17). "High-resolution carbon dioxide concentration record 650,000–800,000 years before present". Nature. 453 (7193): 379–382. Bibcode:2008Natur.453..379L. doi:10.1038/nature06949. PMID 18480821. ↑ Ruddiman, W.F. ; Kutzbach, J.E. (1991). "Plateau Uplift and Climate Change". Scientific American. 264 (3): 66–74. Bibcode:1991SciAm.264...66R. doi:10.1038/scientificamerican0391-66. ↑ Clark, Peter U.; Dyke, Arthur S.; Shakun, Jeremy D.; Carlson, Anders E.; Clark, Jorie; Wohlfarth, Barbara; Mitrovica, Jerry X.; Hostetler, Steven W. & McCabe, A. Marshall (2009). "The Last Glacial Maximum". Science. 325 (5941): 710–714. Bibcode:2009Sci...325..710C. doi:10.1126/science.1172873. PMID 19661421. ↑ Davies, Ella (2012-05-07). "BBC Nature - Dinosaur gases 'warmed the Earth'". Bbc.co.uk. Retrieved 2012-08-07. ↑ Hu, Aixue; Meehl, Gerald A.; Otto-Bliesner, Bette L.; Waelbroeck, Claire; Weiqing Han; Loutre, Marie-France; Lambeck, Kurt; Mitrovica, Jerry X.; Rosenbloom, Nan (2010). "Influence of Bering Strait flow and North Atlantic circulation on glacial sea-level changes". Nature Geoscience. 3 (2): 118. Bibcode:2010NatGe...3..118H. doi:10.1038/ngeo729. ↑ 2c (Quaternary Glaciation — Extent and Chronology, Part III: South America, Asia, Africa, Australia, Antarctica Kuhle, M. (2004). "The High Glacial (Last Ice Age and LGM) ice cover in High and Central Asia". In Ehlers, J.; Gibbard, P.L. Quaternary Glaciations: South America, Asia, Africa, Australasia, Antarctica. Development in Quaternary Science: Quaternary Glaciations: Extent and Chronology Vol. 3. Amsterdam: Elsevier. pp. 175–199. ISBN 978-0-444-51593-3. ↑ Kuhle, M. (1999). "Reconstruction of an approximately complete Quaternary Tibetan inland glaciation between the Mt. Everest- and Cho Oyu Massifs and the Aksai Chin. A new glaciogeomorphological SE–NW diagonal profile through Tibet and its consequences for the glacial isostasy and Ice Age cycle". GeoJournal. 47 (1–2): 3–276. doi:10.1023/A:1007039510460. ↑ Kuhle, M. (2011). "Ice Age Development Theory". In Singh, V.P. ; Singh, P.; Haritashya, U.K. Encyclopedia of Snow, Ice and Glaciers. Springer. pp. 576–581. ↑ Richard A. Muller. "A New Theory of Glacial Cycles". Muller.lbl.gov. Retrieved 2012-08-07. ↑ Rial, J.A. (July 1999). "Pacemaking the ice ages by frequency modulation of Earth's orbital eccentricity" (PDF). Science. 285 (5427): 564–8. doi:10.1126/science.285.5427.564. PMID 10417382. ↑ Paillard, D. (22 January 1998). "The timing of Pleistocene glaciations from a simple multiple-state climate model". Nature. 391 (6665): 378–381. Bibcode:1998Natur.391..378P. doi:10.1038/34891. ↑ Rieke, George. "Long Term Climate". Retrieved 25 April 2013. ↑ "PETM: Global Warming, Naturally | Weather Underground". www.wunderground.com. Retrieved 2016-12-02. ↑ Hallberg, G.R. (1986). "Pre-Wisconsin glacial stratigraphy of the Central Plains region in Iowa, Nebraska, Kansas, and Missouri". Quaternary Science Reviews. 5: 11–15. Bibcode:1986QSRv....5...11H. doi:10.1016/0277-3791(86)90169-1. 1 2 Richmond, G.M. ; Fullerton, D.S. (1986). "Summation of Quaternary glaciations in the United States of America". Quaternary Science Reviews. 5: 183–196. Bibcode:1986QSRv....5..183R. doi:10.1016/0277-3791(86)90184-8. ↑ Kuhle, M. (1984). "Spuren hocheiszeitlicher Gletscherbedeckung in der Aconcagua-Gruppe (32–33° S)". Zentralblatt für Geologie und Paläontologie Teil I, Geologie. 11/12: 1635–46. ISSN 0340-5109. Verhandlungsblatt des Südamerika-Symposiums 1984 in Bamberg. ↑ Kuhle, M. (1986). "Die Vergletscherung Tibets und die Entstehung von Eiszeiten". Spektrum der Wissenschaft (9/86): 42–54. ISSN 0170-2971. ↑ Kuhle, Matthias (June 1987). "Subtropical Mountain- and Highland-Glaciation as Ice Age Triggers and the Waning of the Glacial Periods in the Pleistocene". GeoJournal. 14 (4): 393–421. doi:10.1007/BF02602717. JSTOR 41144132. 1 2 Kuhle, M. (2004). "The Last Glacial Maximum (LGM) glacier cover of the Aconcagua group and adjacent massifs in the Mendoza Andes (South America)". In Ehlers, J.; Gibbard, P.L. Quaternary Glaciations: South America, Asia, Africa, Australasia, Antarctica. Development in Quaternary Science. Amsterdam: Elsevier. pp. 75–81. ISBN 978-0-444-51593-3. 1 2 3 Kuhle, M. (2011). "Ch 53: The High-Glacial (Last Glacial Maximum) Glacier Cover of the Aconcagua Group and Adjacent Massifs in the Mendoza Andes (South America) with a Closer Look at Further Empirical Evidence". In Ehlers, J.; Gibbard, P.L. ; Hughes, P.D. Quaternary Glaciations – Extent and Chronology: A Closer Look. Development in Quaternary Science. Amsterdam: Elsevier. pp. 735–8. ISBN 978-0-444-53447-7. ↑ Brüggen, J. (1929). "Zur Glazialgeologie der chilenischen Anden". Geol. Rundsch. 20 (1): 1–35. doi:10.1007/BF01805072. ↑ Andersen, Bjørn G.; Borns, Harold W. Jr. (1997). The Ice Age World: an introduction to quaternary history and research with emphasis on North America and Northern Europe during the last 2.5 million years. Oslo: Universitetsforlaget. ISBN 978-82-00-37683-5. Retrieved 2013-10-14. ↑ Johnston, A. (1989). "The effect of large ice sheets on earthquake genesis". In Gregersen, S.; Basham, P. Earthquakes at North-Atlantic passive margins: Neotectonics and postglacial rebound. Dordrecht: Kluwer. pp. 581–599. ISBN 0-7923-0150-1. ↑ Turpeinen, H.; Hampel, A.; Karow, T.; Maniatis, G. (2008). "Effect of ice sheet growth and melting on the slip evolution of thrust faults". Earth and Planetary Science Letters. 269: 230–241. Bibcode:2008E&PSL.269..230T. doi:10.1016/j.epsl.2008.02.017. Wikisource has the text of The New Student's Reference Work article about Ice age. Raymo, M. (July 2011). "Overview of the Uplift-Weathering Hypothesis".